I am so excited to finally be able to show you this quilt. I have shared the centre medallion previously, but have had the final photos under embargo until this week when the quiltalong wraps up. It is a quilt, quite literally, built on blood, sweat & tears. From the three days of cutting that left me aching and frustrated (because I am a goose and can’t read properly. Or use grided template plastic properly), to the, ahem, “humility” error in the centre block, to two full days of frantic sewing at quilt camp to ensure it would be done in time for the quilter so I would have it back before Christmas. 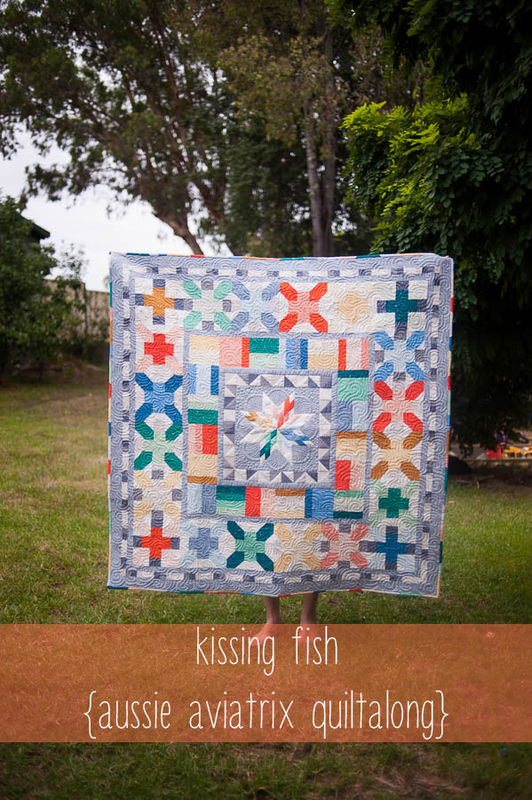 It was at quilt camp, with the pieces of the quilt and quite possibly my sanity were hanging on the wall, when Kylie pointed out that the orange and green in the centre medallion looked like two fish kissing, and just like that, a quilt was named. It was also at quilt camp that the girls talked me into giving myself permission to not make the full-sized quilt – it was a gift for soon-to-be WA-based friends, a large quilt wasn’t needed. They were my least favourite and also quite intensively pieced. So we decided they could be scrapped and the already cut pieces put to use as a scrapping binding. Not long after I decided to join the quiltalong, with no real idea of what I would do with the quilt, a very dear friend announced not only was she & her family moving, but the move would take her about as far away from here as one can get and still be in Australia. Western Australia was calling their family, and I knew then, that this quilt would be theirs. I managed to, while cutting the final border, slam my rotary cutter (complete with fresh blade) into the tip of my middle finger, that even now bears a scar. With a giggle, my friend & I decided it should be named for their family, and I went on to reassure her that no actual blood had made it onto the quilt. I sweated as the weight of the quilt settled over my lap and I stitched the binding on, on a summery Christmas Day. And I cried. I cried as I started piecing the first border after mentally marking it as theirs, as I adjusted to the news that some of our best friends were leaving. I cried as I finished the top & loved the result & realised I would never see it in used. I cried as I delivered it, the day before they left, as I said goodbye, and as we wished them well and drove away. One of my favourite things about handmade gifts is putting something of myself, putting my time & effort & love into something tangible. It was lovely to hear of it being used to wrap their children in on camp-out nights on their trek across the country, to know that even at a distance, our families were still connected. It was important to me that I be able to gift it in person, and I am grateful that Emma worked hard with the quilting & return to help me make it happen. 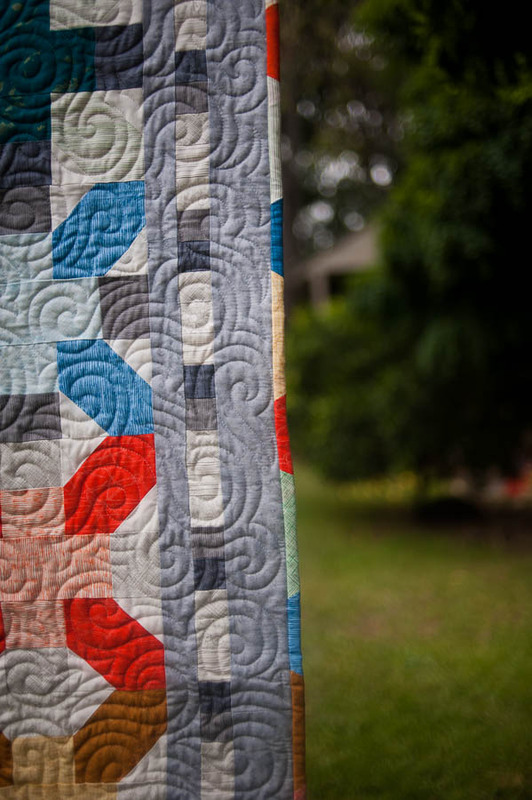 Once I had decided to gift it, I knew that quilting it myself was never going to be an option. My little Janome is a trojan, but it is also little. It struggles with much beyond a cot sized quilt, and for friends who have shared our lives for over a decade, I wanted something special. Emma quilted it with this fabulous semi-custom all-over which I just adore. I have long envied Emma’s quilting skills, and it was delightful to be in possession of one of her masterpieces, if only for a few days, and I really am glad I went the extra mile & got it professionally quilted. Days of cutting. Weeks of sewing. Mad hours of binding, and moments in the gifting, to mark a decade of friendship, and a lifetime of prayers & best wishes to those who sleep under kissing fish. It’s absolutely gorgeous! I love the colours and the quilting just completes it perfectly. It’s divine. 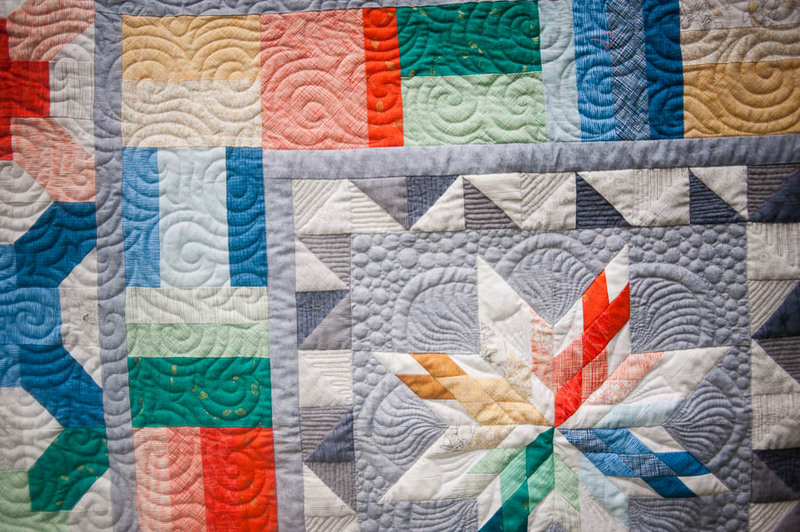 The colours are gorgeous and that quilting is just amazing. A beautiful quilt. You have outdone yourself! It’s just beautiful! I love the colours, I love the design – it’s perfect! And what a wonderful gift! Oh my you nearly had me in tears! The perfect gift for what sounds like the perfect friendship – I’m sure they’ll treasure it always and that you’ll have the chance to see it again. I considered doing a smaller version too and now I’ve seen yours I think I will. Awww *big hug* if it makes you feel better, I was sooky writing it! I’m really happy with how the smaller version turned out.